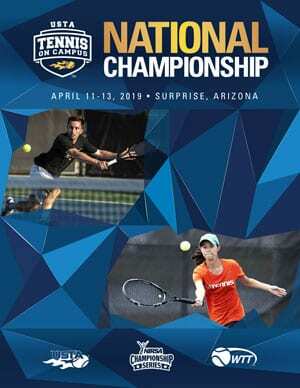 April 11-13, 2019 at the Surprise Tennis & Racquet Complex in Surprise, Arizona. Team Play — first Match at 8am, plan accordingly. Entry fee, team rep contact information and roster information for one player will be the only items needed for the initial sign-up (pre-registration). Registration link will be emailed to team rep. Teams will be able to change roster up until March 23, 2019. After this date roster will be frozen and changes can only be made with approvals from tournament co-director Valerie McCutchan. Enrollment verification forms will be sent via email to team reps by March 27 this form will need all participants signatures, and must be signed by sport club director and the university registrar. Teams must qualify at their USTA TOC Sectionals Championship or receive a bid from another TOC tournament. For more information, contact Valerie McCutchan. Each USTA Sectional Championship has a set number of bids, please review for dates of your TOC section event. Only one team per school will be allowed in the championship. Teams will play “Round Robin” or “Pool Play” and then advance into bracket play – compass draw. Teams are guaranteed seven matches (if all teams show up for scheduled matches). All teams will have matches on Saturday. A match consists of no-ad sets and includes men’s singles and doubles, women’s singles and doubles and one mixed double. 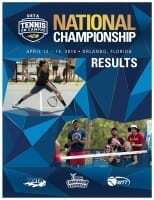 All rostered players must have a played in TWO events representing their team/ school in the same academic year and prior to the USTA Campus Championship. An event is considered a dual match, a tournament, or a USTA Campus Championship – Sectional event. 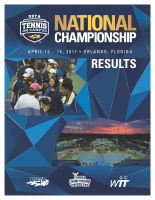 Thank you to all of the volunteers and supporters of the 18th Annual USTA Tennis On Campus National Championships. Congratulations to the champions – as well as all participants. Questions about the USTA Tennis On Campus National Championship can be directed to the NIRSA Director of National Sport Programs, Valerie McCutchan.